A. Once we have received your order and payment, your custom hand crafted saddle will be added to our production queue. If your saddle has our standard options and tooling, you can expect your saddle in 4-8 weeks depending on the season. Saddles with special options/ requests, including 3/4 Full tooling can be expected in 9 – 15 weeks. (Accessories with 3/4 & Full tooling can be expected in 6 weeks.) Feel free to contact us ahead of time to see how our schedule is running at 915-345-4130. 1. Accessory returns require the item to be unused and in new condition. 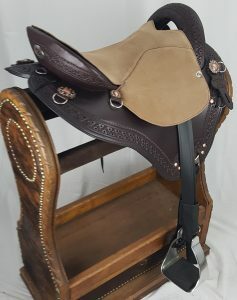 If you are not fully satisfied with the purchase of a new TW Saddlery Saddle you can return it in new condition within 10 days for a full refund less freight. You are required to contact our office (915-345-4130) for a RMA number PRIOR to return. 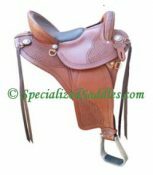 Saddles returned without a RMA number will be refused and will not receive a refund.Your full purchase price (minus shipping charges) will be refunded within 30 days after receipt of saddle. 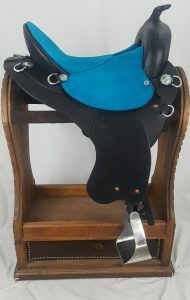 NOTE: ANY saddles made with non-standard custom options not available on the order form, upgraded seat color, or semi full and full tooling are non-refundable. TW Saddlery warrants products we manufacture will be free from defects in material and workmanship for a period of 90 days after the invoice date of purchase. The sole responsibility and obligation of TW Saddlery is to repair or replace at its discretion, product during limited warranty period. 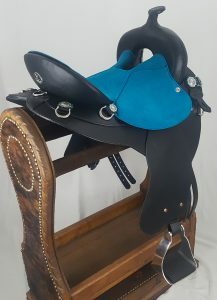 TW Saddlery warrants saddles we manufacture will be free from defects in material and workmanship for a period of 1 year after the invoice date of purchase. Saddle trees have a five year limited warranty. 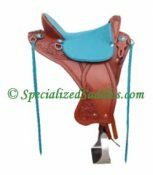 The sole responsibility and obligation of TW Saddlery is to repair or replace saddle tree at its discretion during limited warranty period. A. Each type of TW Saddle has a different weight – our Westerns weight 17 to 25 lbs. 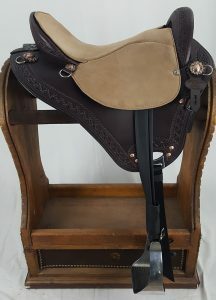 A. TW Saddlery Saddles are crafted using the highest quality grade 1 leather from Wickett & Craig Tannery. It is the finest US tanned leather available. The leathers are made following the time honored tradition of natural and eco-friendly veg-tanning. Saddles result in rich patinas that only better with riding and age. A. TW Saddlery saddles are made in one of our two factories in Texas. Q. How long has TW Saddlery been in business? Trail fenders have a biothane neck that connects the fender to the stirrup. Biothane is very flexible and requires NO breaking in as well as being extremely durable and very easy to clean. The biothane around the neck of the stirrup allows the foot and leg to move more freely with the horse. This lets the ankle and knee position themselves where is best suited for the rider relieving unnecessary pressure on the knees and ankles. The trail fenders also have a roller buckle fore easier adjustment than the traditional Blevins buckles found on other fenders. 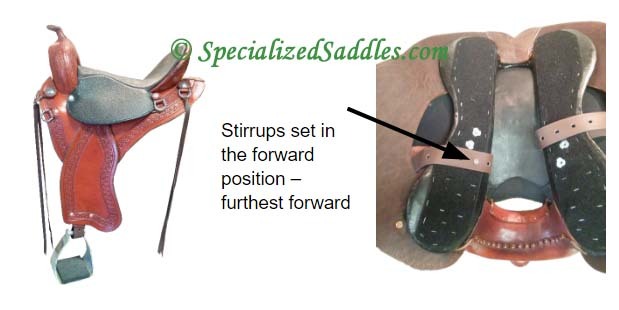 This feature is particularly helpful in saddles that are used by multiple riders and can even be adjusted while on the horse. Shown to the right left is the trail fender on the Eurolight. Q. 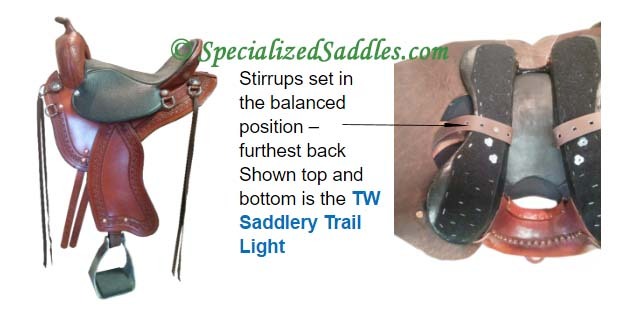 How are stirrups adjusted with TW Saddlery’s adjustable stirrup positioning?